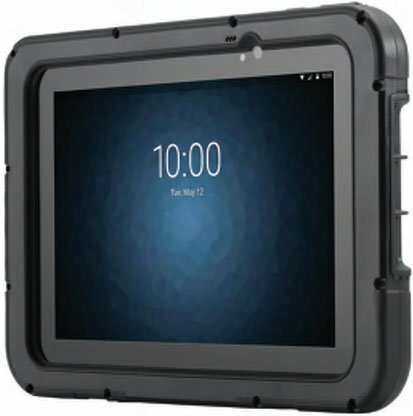 Zebra’s ET50/ET55 marries the best of consumer-style tablets and fully rugged tablets to create a new cost-effective category of tablet that offers the flexibility, features, functionality and durability required to meet the majority of today’s enterprise needs. Users can also choose the display size that provides the right amount of real estate for their business applications, an 8.3 inch or 10.1 inch display. With a comprehensive accessories ecosystem, the ET50/55 can adapt to diverse working conditions and environments, expanding the range of functions a tablet can tackle in the enterprise. Finally, a flexible business tablet your customers can customize for just about any job and any environment, from retail associates and warehouse workers inside the four walls to salespeople, delivery drivers and service technicians out in the field. With the ET50/ET55 series You get the best of both world: consumer styling for employees plus all the enterprise class features and options your customers need to meet business needs: enterprise durability, constant battery power, choice of Android or Windows, a rugged frame for extra durability in more demanding environments, two display sizes, GPS, NFC and fast Wi-Fi and cellular wireless connections, 802.11a/b/g/n Wi-Fi with the ET50 and 4G LTE with the ET55. When it comes to data capture, this tablet offers it all; two integrated cameras for image capture, bar code scanning and video calls; optional advanced scan engines and innovative Bluetooth scanners for comfortable intensive barcode capture; and three methods of data entry that work even if the screen is wet, an active or passive stylus or a finger, with or without a glove. With an extensive WLAN capability, the ET50 is engineered from the inside out to handle all day everyday business use. Whether it’s dropped or something gets spilled on it, workers will enjoy continuous reliable operation. Corning Gorilla Glass 3 with Native Damage Resistance allows the display to better survive the real world events that commonly cause glass failure. With LTE capability, the ET55 is engineered from the inside out to handle all day everyday business use. Whether it’s used in the rain, snow, or in a very dusty area, workers will enjoy continuous reliable operation. IP65 sealing provides a dust-tight design that can handle a hose-down at full force. And while this tablet is built to handle a drop from 3.2 ft/1 m, you can nearly double the drop specification with the rugged frame. The enterprise tablet market barely existed a few years ago and yet the adoption of enterprise tablets continues on an upward trajectory that few predicted where an ever increasing set of applications and use cases are emerging. On one hand, big windows applications are being modified to support mobility. On the other, needs being satisfied by traditional mobile handheld devices are now being met with enterprise class tablets providing improved processing power, battery efficiency, and durability. Empower your employees with Zebra’s ET50/55, the only solution on the market that addresses all the business issues associated with deploying tablets inside and outside the enterprise, from durability, security and expandability to device and application management. The ET50/ET55 marries the best of consumer-styling with all the enterprise-class features needed to increase workforce productivity. Workers get the elegant personal tablet styling they want, while the enterprise enjoys a superior return on investment with a rugged design built to last for years, exceptional battery power, enterprise-class data capture, business accessories, solution expandability, enterprise-class security and centralized manageability.